Melted Bodies creates music for people to propel their limitless potential. Jane Machine lies somewhere in your subconscious catharsis. 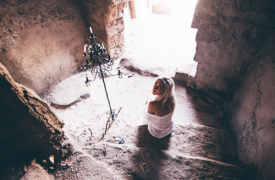 Erica von Trapp, vocalist, songwriter, and producer, explores space, demons, and desires through a mix of layered synths, intimate vocals, and head-nodding electronic percussion. The result is a haunting pop noir, vacillating between sensuality, gloom, and mania. Von Trapp started producing music back in Paris in 2014 and after moving back to Los Angeles/the California desert (where she is from) has a strong notion for lush electronic textures combined with a vehemently ethereal natural space. Jane Machine’s first LP “Back Seat Driver” was birthed in France after she left the United States following significant family losses. The album was finished in the high desert and Northeast Los Angeles by 2017. She is finishing up the next LP in her studio in her Joshua Tree desert studio, scheduled to release early next year. Led by the wildest drag queen since Divine, DMTina and the Bumps blends raw androgyny with punk angst to create an alluring sonic assault. 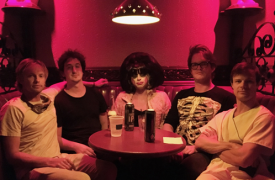 DMTina was unleashed as the campy opening act for the Growlers in 2014, but expanded into a full band in late 2015 and has been blowing away audiences ever since. 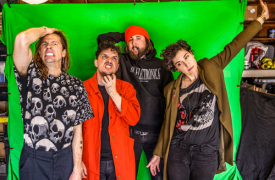 The LA-based band has played festivals like Beach Goth and Burgerama and recently headlined a July residency at Harvard and Stone. Their in-your-face, boozy performances have been covered by LA Weekly, OC Weekly, and other publications.